I had to leave the state for about 6 weeks, and was not able to garden for another 2 weeks once I got home. I had a friend water the garden, when the monsoon rains didn't reach it, but no weeding was done. This is what the garden looked like when I got back. Big picture of the Waffle Garden after the monsoon. Up close picture of the Waffle Garden, post-monsoon. You'll notice a complete absence of waffles now. The monsoons utterly washed them away. There is nothing remaining but flat ground. 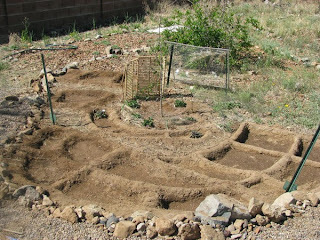 I dug in the recessed areas a little, but mostly raised walls. From this experiment, I would say that this does not work with our monsoon season. The monsoons were heavier than normal this year, but still, they washed out the walls like there weren't even there. According to my garden caretaker, the recessed areas did retain water well, before they were washed away, so I will still try to make a recessed garden again. I won't be building up walls, however, but merely digging them in completely. We'll see how that does instead.